It was a historic occasion on the floor of the National Assembly when Lee Mark Chang, 37, the well known proprietor of Chon Saan Palace, was sworn in as the pro temp President of the Senate on Wednesday, August 18. Many of Chang’s relatives and friends filled the gallery to watch as the Clerk of the National Assembly, Eddie Webster, swore in Chang as the first Chinese/Belizean Senator of Belize. Opposition senator Lisa Shoman hailed Chang’s ascension to the Senate Presidency as the epitome of Belize’s cultural diversity, and every other senator who congratulated him on the important milestone he has made on behalf of the Belize Chinese community. 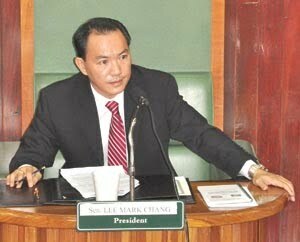 Chang, the son of immigrant Chinese parents, was born and educated in Belize, and has risen to become the United Democratic Party’s standard bearer for the Freetown Division. He is holding the senate presidency for Andrea Gill, who is away on maternity leave. Former Mayor of Dangriga, and former radio personality Frank “Pawpaw” Mena was also sworn in as a full time senator, filling the seat left vacant when Eddie Webster was appointed as the Clerk of the National Assembly. The Senate is comprised of six government senators, three opposition senators and three private sector senators. At the last sitting of the House of Representatives, Prime Minister Dean O. Barrow said that he would not go ahead with the proposed reform of the Senate that would have added one more senator, bringing the number of senators to thirteen. Barrow said that he might have been overly optimistic when he promised to reform the Senate in his party’s manifesto prior to the 2008 General Elections. The session of the senate saw a number of Bills receive their second reading under the presidency of Lee Mark Chang, before the public business was concluded and the whole Senate met as a committee. WOW!! This is very nice to know!